After just four months it helped those caused by chronic disorders including Parkinson’s disease, multiple sclerosis, motor neuron disease and spinal cord or nerve damage, the study said. About seven in ten (69 percent) reported some improvement after taking cannabis for four months. The researchers found it was safe and effective, and it also caused a third of patients to reduce their use of highly-addictive opioids, that have killed more than 200,000 Americans in the last eight years. Study author Dr Laszlo Mechtler, of Dent Neurologic Institute in Buffalo, New York, said: ‘With legalization in many states, medical marijuana has become a popular treatment option among people with chronic diseases and disorders, yet there is limited research, especially in older people. There is huge demand for researchers to investigate the drug which is increasingly popular among patients, but with little scientific literature to back up its benefits. In New York, where Dr Mechtler is based, marijuana is legal for medical use. And a recent report found that most of the state’s 98,000 medical marijuana users are aged 50 to 70. To investigate how the drug impacts this age group, Dr Mechtler analyzed 204 over-75s, with an average age of 81, who were enrolled in New York State’s Medical Marijuana Program. 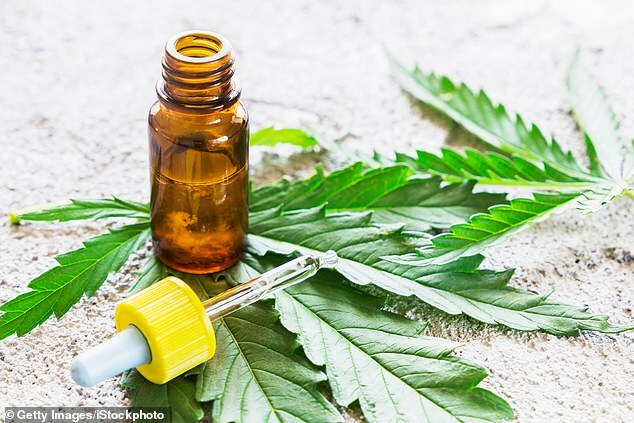 Participants took various amounts of THC (tetrahydrocannabinol) and CBD (cannabidiol), the main ingredients in medical marijuana, for an average of four months and had regular checkups. The former is the psychoactive compound in cannabis that makes users ‘high’, interacting with receptors in the central nervous system. The latter does not have this effect, and is thought to help reduce anxiety and inflammation. They were administered either in liquid form, as a capsule or in an electronic vaporiser. The biggest benefit was seen for pain with about half (49 percent) experiencing relief. Sleep problems were reduced in almost a fifth (18 percent). Numbness or weakness triggered by a breakdown in nerve signalling, known as neuropathy, decreased for one in seven (15 percent) and anxiety improved in one in ten (10 percent). What is more, one in three (32 percent) ended up taking fewer opioids which often lead to addicts experimenting with illegal substances such as heroin. They have caused more deaths by accidental overdose than any other drug in US history, leading to a national public health emergency being declared in 2017. Dr Mechtler said: ‘Our findings show medical marijuana is well-tolerated in people age 75 and older and may improve symptoms like chronic pain and anxiety. Initially, a third (34 percent) of participants had side effects from the medical marijuana. But after an adjustment in dosage, this fell to a fifth (21 percent). The most common were sleepiness (13 percent) followed by balance and gastrointestinal problems (each 7 percent). Three per cent stopped taking the medical marijuana due to the side effects. Dr Mechtler’s team found an equal quantity of THC and CBD was the most common ratio for those who reported no side effects. CBD actually decreases the effects of THC, and is not psychoactive. They pointed out the preliminary study was retrospective and relied on participants reporting whether they experienced symptom relief. So it is possible the placebo effect may have played a role. The researchers called for additional randomised, placebo-controlled studies are needed to confirm the results. According to the Centers for Disease Control and Prevention, about 80 percent of older adults have at least one chronic health condition. The findings will be presented at an American Academy of Neurology meeting in Philadelphia in May. Last year a study of more than 2,700 over 65s in the US found medical marijuana eased pain in more than 90 percent of them. Out of a pain scale of 10, taking the drug for six months reduced scores from an average of eight to four.